The genealogy section has moved to the Barford Heritage website. While the information below will be retained, it will not be updated in future. I don’t propose to transfer all the existing genealogy requests. Please follow this link to the new genealogy pages and become part of an on-line community where you can freely exchange information about Barford genealogy. I am researching the origins of a Miss Caroline Danella Hewitt, b. 1872, who in 1920 founded the New York school where I am Director of Archives. On the Ellis Island ship manifest, she listed Barstow, Warwick as her town of origin. Her mother's name was Harriet Wells Hewitt. There were two siblings: Ada and Hubert. Do you have any information about this family? My name is Gill Ryan and I have been researching my family tree. My great great grandmother JANE CROFTS was born in Barford in 1844. She was the third daughter of SARAH and JOHN CROFTS. The other daughters were Ann and Mary. JANE married JOHN ABEL but I'm not sure whether they married in Barford. I know that SARAH was born in Tachbrook in abt 1813 and that SARAH and JOHN died in Warwick in 1872 and 1869 respectively. Do you have any information on Jane or Sarah & John and Sarah's maiden name? My great great grand father lived at Barford from 1841 – 1882. His name was John Currall and his wife Hannah Woodfield. He lived in Church Street, now Alderham House. Have you any info please? Fanny born in Barford c1858 was my ggg grandmother on my father's side. She married George Edward Dodwell (Wolverhampton 1851) at the local parish church in 1876. She had a brother Joseph and sisters Sarah Louisa and Catherine who it is believed married, in the following order, Wm Smith (1872), Matt Snell(u/k); John Elmore(1888) and John Tranter(1913). Any information on these, their ancestors or successors would be greatly appreciated. Researching DREWES, any knowledge welcome after 1066 to 1800. I have relatives who where born in the Wasperton and Barford area. Ann and John went on to have 3 other children, where they were born I do not yet know. Ann and John were my Great Great Great grandparents and their daughter Jane my Great Great Grandmother. I think I may have traced my Ward ancestry back to a William Ward who is said to have been born in Barford, Warwicks about 1590 (where the family were Lords of the Manor) the son of Thomas Warde Esq. He went to Queens College, Cambridge, before becoming Rector at Allesley. He married Elizabeth and was, apparently, a bit of a character - he was renowned for getting into drunken fights on a Sunday!!!! He died in 1643 and was buried at Allesley. Further information on these Barford Wards would be most welcome. Son William Hibberd 1870 – Sherbourne. I am searching for any information on the family of James Rawlins born 1761 Wasperton. He seems to have spent much of his life in Pentonville London and returned to Wasperton where he died in 1841 a rich man. His daughter Eliza married Richard Henry Taylor of Barford and the daughters of his son John (in London) married George Earl (animal painter) successively. Any more information gratefully received. I am looking for any information on my grandfather. Soloman Maull. I believe he was born in Barford in 1866. Any information would be appreciated. Does anybody know if there are still any Stantons living in Barford/ Alvescot/ Shipton-Under-Wychwood. I am looking for any descendants of a William Stanton b in Alvescot about 1810, who married a Jemima Roberts. They married at Shipton-Under-Wichwood on 24th May 1831. I am interested in anything known of Taylors in Barford, specifically Richard born 1773 and his ancestors and descendants. Richard was a wheelwright, as was Frank Taylor in 1900. Presumably there is a connection right through. Does anyone know of any living descendants? Please get in touch. I have been through all the censuses from 1851. Click for another posting for Taylor family. I'm looking for any information about my great great great grandfather whose name was John Hortin. He and his wife Ann settled in Barford in the early 1800 and all of his children were born in the village. There was already an established family of Hortins there, one of whom owned a farm in Sherbourne and another in Snitterfield. Trying to find a possible link. Is there a local history group or someone with local history who could help. My father and I are looking for information on our family tree. Can you help with any information. John Henry Hone emigrated from England in 1887. I am looking for any information regarding my GG Grandfather James French (born in Ladbrook in 1836) and Jane French (born 1836 in Baginton). I believe they had about 7 children in total. James worked as an Groom/Head Groom in Barford between 1870 and 1890 at Staple Hill House/Farm. Does anybody have any information regarding the above. I would appreciate any help. Does anyone have any recollections of GEORGE TAYLOR or his daughter ELIZABETH who are listed as living at Hampton Wood in the 1901 census? Likewise, for BERTHA Taylor (another of George's daughters) who was in the employ of Henry Oldhams at Court Farm in the same census. George Taylor is my Gt Gt Grandfather on my mother’s side. My Grandfather used to have a bakery on Wellesbourne Road in Barford between 1916 and 1920. Are there any recollections of this in the local area? His name was ALBERT WILLIAM IRELAND and his wife ELIZABETH (nee Taylor). He died in Wellesbourne in 1949 and she died in 1962 also in Wellesbourne. I believe they gave up the bakery and moved to Wellesbourne because there were financial difficulties, he not being a businesssman. My mother, BERTHA JOAN GRAINGER (nee Ireland) was born in Barford on 20 February 1920 - where, I have no idea, although I suppose at the bakery. (Ignore references to buns and ovens!). In your Reminiscences, “Memories of Barford and Sherbourne by Tony Talliss”, the 5th paragraph refers to a Fred Ireland. He is my cousin although I know nothing of him or his family except that he had a daughter and they lived in the first house in the straight row of houses set back on the left of the road to Wellesbourne as you leave Barford, opposite a public house. My mother's brother Jack (really christened Albert) frequented the Joseph Arch public house in the 1960's with his wife Lena and they lived in Sussex Road, Coventry. Any information however small on any of these persons would be gratefully received. My GGG Grandfather's brother Thomas Snowsill was b. on the 28th February 1735 in Burton Dassett. At some stage he has moved to Barford. We have the marriage of Thomas Snowsill and Mary Sheeler on the 18th April 1780 at Barford, Warwickshire. Thomas was 45 yrs old. We don’t know if either of them were Widow’s or not, and we would like to find out who Mary Sheeler was. In Thomas’s Will of 1785 he mentions his Wife’s brother’s daughter Jane Tatnall and his Wife’s sister’s daughter Jane Walton. From Thomas’s Will he doesn’t appear to have any children, he left everything to his wife and after her death all was divided up amongst family members and nieces and nephews. Thomas Snowsill used to own the Red Lion Inn in Barford (which is now called the Joseph Arch Inn) and he left it to his wife Mary in his Will of 1785. After her death it was to go to Thomas's older brother John, then after his death it was to go to my GGG Grandfather Isaac Snowsill and then on to his children. It was obvious that he intended for the Inn to stay in the family. But in Isaac's Will he does not mention the Inn, only his Freehold Estate, but does not identify the Estate. It would be nice to find out as much history as possible. I would like to find out more about Thomas’s ownership of the Inn i.e. when did he become the owner and the history of subsequent owners, when was it built? etc. Does anyone know where I could look for this information? I would love to hear from other family’s whose Ancestors have at one time or another owned the Red Lion Inn of Barford. I found on a web site that the Flowers Brewery of Stratford on Avon once owned the Red Lion Inn of Barford, but it did not have any dates. Thomas in his Will also talks about, “All my stock in and implements of trade”. At first I thought he was talking about stock for the Inn, but this appears not to be the case. Instead it suggests Thomas was in another trade as well as running the Inn. Does anyone know if there is a register of Business in Barford, covering from abt. 1735 to abt. 1785? Any information would be most gratefully received. I am looking for the Stockley family and any marriages that came from Barford area. Is anyone able to help me solve a problem please? My great-grandmother, Florence Boardman, was born and baptised in Barford [b. 3 March 1864]. Her mother, Fanny, was unmarried and the previous trace I have of her is in the 1861 census where I found Fanny Boardman working as a nursemaid to a family in Islington, London. Fanny was originally born in Retford, Notts in 1845. What would have happened to girls in these circumstances living in Barford? Was there a workhouse or something similar? Any advice would be much appreciated. Thank you. I am looking for any information regarding my great grandmother who was baptised in Barford on 9 April 1864. Her name was Florence Emily Boirdman and her mother was Fanny Boirdman. No name of father given. Her civil registration cert. gives her surname as "Broadman" but her family name is really "Boardman". My wife's great-grandmother is listed in the 1901 Census for London as having been born in Barford, Warwick. It seems likely that she had gone to London for work, and all her of her seven children were born there, from 1883 to 1900. Her married name was Boardman. By 1901 Mr Boardman had apparently died from drowning. Her forename was Florence, and she was 37 in 1901, so born c. 1864. We now have a birth certificate for her daughter, Cissie, and this shows the surname for Florence to be Evans. Is there a baptism record of a girl called Florence in Barford, who then disappears from Barford? to e-mail Chris and Jenny. Francis and Mary Claredg who had children baptised at Barford between 1661 and 1678 (John, Samuel, Thomas are known) Thomas Claridge married Mary Hinto at Barford on 23rd October 1704. Two known children baptised there, Samuel (1708), Thomas (1705). Family then seem to leave Barford. Samuel probably married to Mary Yates at Leek Wootton 27 December 1736 where two sons baptised one of whom, Thomas, may be the Thomas married to Ann Burton at Stoneleigh in 1769 and appearing on the tenants records from 1772. Has anyone any information on Benjamin Herring, who was born in Marsh Gibbon, Bucks, about 1831, but was in Barford in both 1881 and 1901? He was already living in the village by 1856, as I own a printed hymn book with his name, date and location written in. His family was heavily involved in the church, and later brass band in Marsh Gibbon. Any details of his life and death would be much appreciated. Does anyone have any news of some of my father's family who used to live in Barford. My father was George Dunnett. My father's cousin Eustace Williams lived in Dugard Place until the 1970s/80s and then moved to Woodbridge in Suffolk. Has anyone from the village kept in contact with them or their daughter Sally? I was wondering if anyone could help me with some information on the Keyte family. I have traced my surname, Summerton, back to the 16th century and the village of Oxhill. However my great great grandfather, William Summerton married a Hannah Keyte in St. Peters, Barford in November 1817. I believe her father was a William Keyte who married an Ann Taylor in Stratford. On a recent visit to Barford I noticed a Keytes Lane, so any information would be appreciated. Just starting on the family history and Keyte is the surname of my maternal Gparents. I know very little of this line. Perhaps you know of something to help me? G father was William Keyte married to Mary Ambrose. Here is hoping. My interest is in the Barnbrook family genealogy in Barford - Reuben Barnbrook is on your Debt of Honour Register. His parents Charles and Elizabeth were my husband’s great great grand parents. Any info. on the Barnbrooks from Barford would be appreciated. Elizabeth’s maiden name was Blundall. I am researching my paternal great grandfather Francis David Hadley & family, shoemaker of Church Street Barford. Would welcome any contact or information. Thank you. I am trying to trace the descendants of Richard Hadley who married Elisabeth Clarke in Barford in November 1802. They had three children and then Elisabeth died in 1808. I would like to find out more about both of them and their children. If you can help, I would be grateful. I believe my great aunt Charlotte Harrison (1874-1946) may have been employed as a nurse to the children of one of the Hamilton-Russell families. She worked for much of the time I believe in Shropshire, but died whilst living at "Silver Rest" Station Road Hatton Road. It occurs to me that there could be a connection to Westham House, Barford where I believe some of the Hamilton- Russells lived. It would explain her turning up in that area for her retirement as the rest of her family lived in the Aston area of Birmingham. Please do you have any information about Westham House in the 1930's/40's ? I found this contact e-mail from the Barford War Memorial site for Gustavus Lascelles Hamilton-Russell. If you can help, I would be grateful. My interest is the Warner family of Wasperton House and farming Manor Farm in the 17th Century. More specifically the William Warner line which comes down to William born 1861 in Wasperton. Interested to hear from anyone else with similar interest. I am trying to trace my family tree on my father’s side, Albert Pike born Handsworth B'ham 1923 died 1994. His father William Pike (my grandfather) was born in Smethwick B'ham 1887 died 1963, Married Florence Swancutt 1911. John Pike (my great grandfather) married Theresa Selby on the 5 June 1886 Kings Norton, at the age of 22 his father's name on the wedding certificate is William Pike. John and Theresa are listed in the 1901 census at 5 Birchfield Terr Court 1 Brearley St Handsworth B'ham. They give his birthplace as Barford Warwickshire. He married at the age of 22 this would make his birth date about 1863-64, I have looked at the index cards for the years 1860-61-62-63-64-65, the only one any where near is for a John Pike born 1862 Birmingham. I sent for this birth certificate but the place of birth, or parents don’t match. John Pike born 28 Milk St B,ham on the 12 Oct 1862, parents Martin Pike, and what looks like Ellen Pike formerly Conell or Canell. If you think you can help me please contact me. I should first note that I don't actually know anything about the Pikes you mention, or about Barford. My own Pike lineage has been resident in Newfoundland for the past 200 years or more. My reason for writing has to do with a project that aims to determine which Pike lines are related and which are not, with genetic testing being the tool that makes this possible. Click here for the project’s website. So far Pikes of England are under-represented in the project. I'm not quite sure why, but I would like to try to spread news of the project so that more people are aware of it, and hopefully so that more people get involved too. Because I haven't had any success in tracing my own Pike line back to the UK, I'm not familiar with UK-based resources for the Pike family. So if you don't mind, I'd like to ask if you might be able to point me in the direction of websites, societies, etc, which might have some focus on the Pike family in the UK and which might permit me to spread news of the project's existence. Meanwhile, if you are in touch with any other Pike researchers who you think might be interested in the project, please feel free to mention it to them. I have come across another family that is connected to my HONE Family that originate from Wasperton and Barford. Mark Kinman Somerton was baptised at Wasperton in 1808, the son of Charlotte Somerton. Charlotte married Joseph Cashmore at Wasperton in 1809. Mark Somerton married Mary Hone at Epwell, Oxfordshire on 3 January 1831. Mary was born at Swalcliffe in 1810. Hannah Somerton born 1831 Epwell. She married Joseph Turner at Epwell in 1858. They lived at Epwell until Joseph Turner died in the 1890's. Thomas Somerton born 1833 Wasperton died 1855 at Sibford Heath near Epwell. Charlotte Somerton born 1836 Wasperton married William Stone and lived at Woolvercote, Oxfordshire where she died in 1895. Ann Somerton born 1836 Wasperton. It is believed that Mary Somerton (nee Hone) died at Wasperton aprrox 1836-1845. Mark Somerton was residing with his daughter Hannah Turner at Epwell in the 1861 Census. Hope you can help. We are the Huckvale family living in Manchester. We are looking for any relatives living in Barford. My husband’s grandfather was Roland Huckvale (born 1879) thought to have lived in Barford around 1880/90's. We think he moved from there to Liverpool. to e-mail Anne and Martin. There has been further correspondence off-site as a result of this posting. If you would like to contribute, please contact the editor using the "ContactUs" button. Hi, I also am searching for Huckvale ancestors. As I'm in Australia it is challenging to follow up on all possible family leads but hope your family may be connected to Caroline HUCKVALE who married Alfred HUNT and in 1871 had the child Anne in Shipston on Stour, in the counties of Worcester, Warwick and Gloucester. The early rego documentation I have give no details of Caroline or Alfred's ages, birth places etc. This is a long shot but hope but hope it may produce some result. I have researched my own Huckvale family tree, which can be found by clicking here. And there is indeed a Caroline Huckvale there married to an Alfred Hunt. I guess she was a sister of my great grandfather. I have her birth date as Dec 1838 in Burmington, Warwickshire. She was mentioned in the 1851 census (ref: HO107/2076/390) aged 12. But I have no other information. Thomas Neville married Laetitia Hubbard (nee Parsons) 1821 at Barford; Laetitia had been previously married to William Hubbard who died at Barford in September 1818. Wiliam and Laetitia had a son William b: 1816. Thomas Neville and Laetitia had 5 children: Charlotte, George, Mary, Jane and Charles. Thomas had been previoulsy married to Ann Purser in 1816 she died at Barford they had two children: Robert and a Hannah - who married a William Parson at Wasperton in 1837. Any assistance on this family would be appreciated. I am interested in any info on a Smith family that lived in Barford. There was an Annie Smith b.circa 1850 who married Thomas Lucas of Newnham,Northants in 1878. Annie died aged about 35yrs in 1885. She had a sister Jane, and I think their father was James Smith. Anna DUGARD, daughter of Rev. Thomas DUGARD, married to William FAIRFAX, son of John FAIRFAX. I am a descendant of the above and would be interested in any information that is known about them. I am under the impression that Rev. Thomas DuGard was a parliamentarian around the 1650s. I am looking for information about the GREAVES family and also WHITEHEAD family from Barford. I believe the Greaves lived at Watchbury House, and was wondering where that might be, and if it is still standing? We visited in 2001 and I found a grave for Greaves at St Peter's, but that was all. Further to my much earlier communication (see below), I thought you might like to know that my genealogical research into my family from Barford led me to a connection going back as far as 1685! The family history takes in the villages of Bishop's Tachbrook and Fenny Compton and there is even a connection to Horncastle in Lincolnshire. I would still love to know more about my Great grandparents from Barford though. It appears that my Great Great Grandfather was actually a carpenter and they lived at Bridge Street at one time. Gt. Grandfather Edward joined the army and served with the 96th Regt of Foot. They had a tour of Duty in Dublin, Ireland and it is likely that this is where he met my Great Grandmother Elizabeth Moore. If anyone comes across information as part of the new Heritage project I would love to know. Perhaps some of the old signing up papers to the Army are still in existence to confirm what we already suspect. I have recently discovered that one part of my family tree comes from Barford and I would love to know any more about them. According to the IGI there is a Wingate family in Barford Warwickshire. John Wingate & Hannah Woods. We would love to know what became of the family? Who they married, where they lived, where Christened, in which faith, what they did, and all those other lovely little stories that go into making a family history complete. Are there any descendants still in the area? Edward was my great Grandfather (maternal) and his wife's name was Elizabeth ( Surname not yet known). She came from Dublin, Ireland, and according to the 1891 Census they lived in Liverpool. Also on the census it show that she was blind, although this came as a complete surprise to my family. My grandmother had never mentioned it, although there does seem to have been some trauma for the family which we haven't yet fathomed out. Edward is recorded as having died in Liverpool in1898 aged 57. My Grandmother was born in Aldershot and the rest of her family in Liverpool so Edward must have come here circa1881-1884. There was talk of him having worn a uniform with lots of braid but nothing concrete. Perhaps he was military of some sort. He appears on the census as General Labourer so the gold braid doesn't seem to fit the story, but who know what fortunes befell folks in those days. My Name is John McDonald and I live at 159, Church Rd, Litherland, Merseyside, L21 7LJ. Or via the website. I am so looking forward to whatever surprises turn up. I am seeking any info on an Arthur Smith who died in 1945 at Warnesford Hospital. My great Uncle's death certificate states he had a prior illness with encephalitis and Parkinson’s disease. I believe he was hospitalised for an extended period. Would this have been at Warnesford Hospital ? Does anyone know where I might find his hospital records( If they still exist ?). Would these be archived. I am a descendant of THOMAS READING baptised at St Peter's Church Barford in 1826. He Married ANN BLENCOWE in 1848 and lived with his family in Church Street, Barford earning a living as the local Baker. Is anyone else researching this family? Are there any descendants of his living in the Barford area? I am looking for my grandmother's brother, Stephen	WOOTTON EVERETT. He was listed in the 1901 census as	the manager of the BARFORD CREAMERY. He had three	sons: Sidney Stephen, b. 1887, Bromley, Kent, Charles	Wootton, b. 1889 Bromley, Kent and Alfred Andrew, b. 1892, Alesford, Kent. Stephen was born in Wiltshire. I've been looking for my great uncle's family for years, and I would appreciate any scrap of	information. Any information please for the Langston family living In Barford C1912. They lived in a cottage facing the back of the Church. They had about eleven children. Working through the family tree with my uncle, we have traced my great great great grandfather to Isaac Mills born 1801 in Wellesbourne. My grandmother now deceased (maiden name Mills) always maintained that we had a family link to Joseph Arch, and she would have been able to talk about that with Isaac's son, William, her grandfather. I note from research on Joseph Arch's life (and what a lot of achievements) that his wife was Mary Ann (or Marian) nee Mills, born In Wasperton in 1824 or 1825, and that Mary Ann was the daughter of a carpenter. Isaac was definitely a carpenter. I wonder if there is information on Isaac, where he was born and lived , who his wife and children were. Notably was Mary Ann his daughter,as we suspect - or just possibly his much younger sister?? We know Isaac moved through Staffordshire (where his son was born) and ended up in Warrington where all subsequent generations have lived, and where Isaac died. Would Isaac have been a Primitive Methodist lay preacher like Joseph Arch, maybe that explained why for his time, he moved quite often and long. We would welcome any help or comment as to these questions either from local sources in Barford, or from others who know about Joseph Arch's life. Click for Joseph Arch genealogy link. There has been further correspondence off-site as a resultof this posting. If you would like to contribute, pleasecontact the editor using the "ContactUs" button. My GGGrandfather, David Fretwell, (son of Thomas Fretwell) leased and operated The Red Lion in Duke Of York Street, St. James (Piccadilly) London from 1846 until his death (age 34) in January 1849 after which his wife continued to operate it. I have his Marriage Certificate (showing his Father's name as Thomas) and Death Certificate and have traced his wife and descendants but am still trying to confirm his birthplace and ancestry. The only David Fretwell born in 1814 whom I've been able to trace, son of a Thomas, is of the Barford family of Thomas Fretwell and Sarah Smith - their other children being Richard, Henry, Marianne, Sarah, Charlotte, William, Jesse and Thomas. I'm puzzled by the fact that I'm told my ancestor must have been an educated man to have been accepted as a leaseholder in St. James at that time; he has a strong signature and he needed education to handle the various documents required yet his Father's occupation is shown as "Labourer". Any information your readers have about the Fretwell family of Barford and any other suggestions would be appreciated. I am seeking ANY information on the comparatively rare HOBBINS surname. I am sure that more than one family of that name lived in Barford during the 19th century and earlier. One of the female line married in to the Arch family of Barford. I also have reference to a John Hobbins gent, of Barford 1782. Also to the will of John Hobbins Barford gent. 3) to the second son of Job Hobbins 1782. Should anyone have further information will they please e-mail. I thank you in anticipation of a reply. Click here for Cyril's web site. I am seeking information on the family of Henry and Elizabeth Talbot who lived in Barford at the time of the 1901 census. Their children were: Florence, Amy, Ellen Victoria (my grandmother), Harold and Francis (who died in WW1 aged 20). I believe Henry was a Coachman. Does anyone know what happened to Ellen Victoria, also known as Nellie? I think she married Alfred Timms, a local policeman. I would be most grateful for any information about them. Hello: I am interested in the Church family. In the 1891 Census living on Granville Road(?) are Henry Church, aged 35, butler, his wife, Pamela aged 35 and 7 children. Only the youngest 3 children were born in Barford, which means the family didn't move there until about 1885. I am at a standstill here and absolutely any information will be most appreciated. I am writing on behalf of my Father , Mr Walter Andrews , who used to live in Barford , born 1920. His Father’s sister married a Vic Church who had several brothers . Henry Church was a butler at Barford House (that is the name of the house). It was a joke amongst the family that, when serving roast duck, he slipped and fell and the duck landed on the dining room floor. One of the guests said, “Here's the duck , where's Church?”. Wellesbourne Road in Barford is where they lived . As far as my Father knows there wasn't a Granville Road in Barford , just a pub named the Granville. He believes that Henry was butler to a Mrs Graham. Hope this is of some help. I think Dad's memory has gone into second gear! I wish I had a memory like him he even remembers addresses. My Father’s Aunt, Dorothy Andrews, married a Will H Church (my Great Aunt & Uncle). He was a carpenter & then an undertaker .He made my Great Grandfather’s coffin. He lived at 75 , Rugby Road . Cubbington. Vic Church married a lady called Ethel (sorry don't know her surname). My Father called them Aunt & Uncle & went to stay with them for holidays but they were not his real Aunt & Uncle. They lived at. 17 , Sandford Road , Sale Moor , Cheshire. I will let you know if Dad has any more memory recalls. The BARFORD Community site seems like a good place for us to share our family interests. I live in Ontario Canada, but was born at Selly Oak, Birmingham. Much of my ancestry originates around WARWICKSHIRE, and I've done a fair bit of work, being helped by many so I'd be glad to assist anyone. Click here for Joseph Arch genealogy link, contributed by Gord Pace. I am looking for information relating to my great grandfather named Seeley whom I believe was village smith in the 1830's. I understand he was married and buried in Barford. Any leads would be useful. I am trying to find the burial place of the Reverend Lewis Way who died in Barford on 23 Jan 1840 aged 67. A look around the Churchyard recently gave no result. His widow was living in Leamington Spa. He was a founder of what became the Church Mission to the Jews. The Reverend Lewis Way was buried at Leamington Priors and there is an inscription in the church at Leamington Priors. The graveyard has been flattened and no headstone has survived. I am looking for the date of death and place of death of Lewis's wife Mary (nee Drewe). I would have thought that as Lewis was buried at Leamington his wife would have been as well. I think her death was somewhere around 1848. Do you have any idea of the Way's address at Barford - they moved there about 1826 or shortly after. I would be very grateful if you are able to help me at all. I was in my local library and saw your web page but could not reply from there. Many thanks for any information you are able to give me. I am currently writing a book about my Grandparents, Ted & Ethel Pinner who lived in Sherbourne from 1911 until their deaths in 1967 & 1969 respectively. In fact they are still there but in the Churchyard. 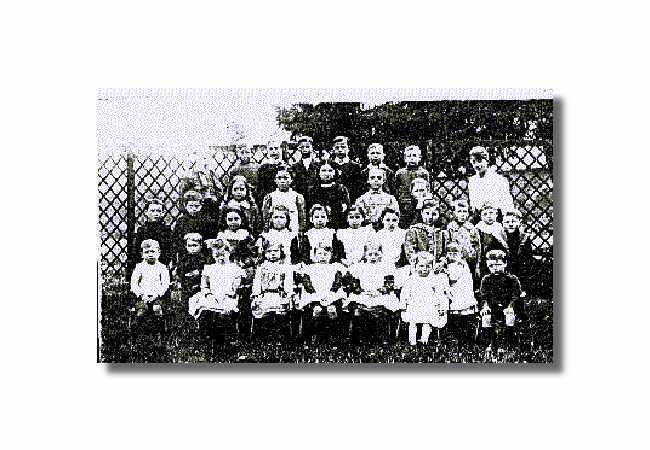 I have come across this photo of Sherbourne School Circa 1916. My father Fred is the third from the right in second row back and his sister Lillian is third from the right in the front row. Does anyone recognise or can they identify any of the other pupils or teachers. I would be particularly interested to know if any of the girls is called "Chrissie". I would also like to hear from anyone who has recollections of Ted and Ethel. Thank you very much for this opportunity to put forward my interests in Barford and Sherbourne and thanks for your great site. I have a few names I am interested in around this area. Namely my main ancestors are the ROBERTS family who lived in Barford and Sherbourne. Samuel ROBERTS was Groomsman for the vicar we think in early 1800's and have been around the area for quite a while before that. HEMMING, and HADLEY are names my ROBERTS married into. It was most interesting reading about the history of the area especially the reminiscences pages. I look forward to hearing from anybody interested in my names. This request has generated some further correspondence off the website about the HADLEY and ROBERTS families. If you know more of the genealogy of these families, and would like to contribute to the exchange of information, please use the link to get in touch via the editor. I'm doing research on Bordesley and Saltley in Birmingham and am tracing a prominent landowner of the 1830 - 1840's, Jane Mills of Barford. I believe she lived at The Rectory. Do you have any information on her family, pictures, burials etc? Thank you - I hope you can help. See also next posting below. I was wondering if anyone in Barford could tell me when John Mills was Rector of the parish, and if there was any other information about him at all. He lived 1712-1791, and between 1752-55 and 1757-60 was Rector of Oxhill. My interest is because he is my wife's ggggg grandfather. I would be most grateful for any information anyone might be able to give. John Mills purchased the advowson of the Barford Rectorship from the Ward family, and in 1745 he was installed as Rector. He retired in 1785 and died in 1791 and was buried in Barford. If he was also Rector of Oxhill, that must have been in plurality. He had two sons, Francis and Charles (there may have been others, but there is no information here about that). Francis was ordained and succeeded his father as Rector. He held this position for 56 years and died in 1851. John's second son, Charles married Jane, the fourth and youngest daughter of the Hon.Wriothesley Digby of Meriden. Charles became MP for Warwick, and held this post during six parliaments, and died in 1826. Jane survived him and died on 21st August 1844 aged 81. It is quite possible that after the death of Charles, Jane may have spent much of her time in Barford. There is certainly a very elaborate urn to her, and two of the chancel windows were installed in her memory. The Church was substantially rebuilt during the 1840's The School originally founded by Thomas Dugard in 1667, was re-endowed by Francis Mills in 1837. We do not appear to have any record of any of the issue of either Francis or of Charles. The substantial monuments to Charles and Jane were erected by their friends. A "Terrier" of about 1812 shows that about two thirds of the lands in the parish of Barford were in the hands of either Francis or Charles. The advowson is still in the hands of the Mills family, whose primary seat is the manor of Bisterne in Hampshire. After Francis the next (and last) Mills Rector was Cecil from 1866 to 1901. Cecil was the son of John Mills of Bisterne. The Mills family, as far as I know has no one currently in Holy Orders, but a scion of the family still sits as one of the Trustees of the School. And subsequently, the following "thank you"
I just wanted to say many thanks to both of you, as I have now heard by email from Julian Mills with the information I was hoping for, namely three generations of Rev John Mills forbears. He is sending fuller detail by post. I am particularly pleased as I had in fact written by post to Julian Mill's elder brother John about two years ago, but never heard back. Either it never reached him or he is not interested in such things. The power of the internet! All the best to the Barford Community Website. If you know more of the genealogy of the MILLS family, and would like to contribute to the exchange of information, please use the link to get in touch via the editor. Charles Thomas is my wife's great great grandfather. We have little information on him or his daughter, Mary Ann Thomas. On recent visit to Barford we found his grave in the churchyard. Are there any parish or school records of his time in Barford. Also seeking information on Mary Ann's life, her husband, Robert Broadhurst, and her connections with Claydon House, Buckinghamshire and the Verney family. Trying to trace my wife's family roots. Family name Wyatt. Believe William Wyatt, farmer at Welford on Avon may have married a Sarah Ann Hewitt around 1867. From Barford. Believe her maternal family was Churn. Looking for family of William from 1867-1910? Especially Stephen Eric Wyatt, b.1910. Some linkage to the town of Leamington. I am looking for connections to these surnames between 1700-1950 in Barford, Wasperton and Knowle. We have quite a lot of info to share with any links that come up. Please email me. I have just found the Barford Community website and found your enrty re the Parson family. I am sure there possibily will be a connection. This is what information have so far if the family is connected would appreciate any information that you can share with me. 2. Hannah Neville b: 1818 who married a William Parsons on 8 July 1837 at Wasperton. 1. Charlotte b: 24 June 1822 Wasperton married Charles Hone 1843 Leamington (this is my line) they lived at Ratley, WAR until emigrated to Australia in 1854. Thomas 1851, Charlotte 1854, Sarah Ann 1857, Thomas 1864, George 1867. 5. Charles b; 1834 believed to marry Hannah Assinder at Wasperton 10 February 1863. My grandfather was born in or around Barford. His name was Albert Damase Lambert. He is the son of Damase and Lucinda Lambert. I am currently tracing my family tree and any information on these individuals is greatly appreciated. Information wanted - Barford lunatic asylum! Has any local historian any knowledge of, or where, the Barford lunatic asylum existed? A member of my family was listed in the "London and Provincial Medical Directory" in 1848, a Dr Ralph Augustus Busby, as being the Medical Attendant to Barford Lunatic Asylum. He was a medical practitioner in Leamington and also lived there. I assume that it may well have been a private establishment. to e-mail information to Ann. My great great grandmother was Maria Harwood from Barford, and I believe she was born in 1830. I don't know anything more about her family, whether she had any siblings, who her parents were etc. She married in Dublin and they migrated to Australia in 1854. I would be very interested to hear from anyone with information about this family. to e-mail information to Leonie. My name is Dave Tandy. Both I and my father, Ronald George Tandy grew up in Warwick. My father knows that his Grandmother's maiden name was "Arch" and believes that she was related to Joseph Arch, but he doesn't know her first name. Can anyone help establish the link between our family and Joseph Arch? We would be most grateful. to e-mail information to Dave. Click here for Joseph Arch genealogy link. The following e-mail has been received from Lawrence Arch, a grandson of Joseph. I have enjoyed reading the claims of relationship, near and distant, to Joseph Arch of Barford in your website’s genealogical column and Gord Pace’s website in Ontario. All of my Arch information, except that of my own family, was obtained from our dear friend and distant relative, William Henry (Harry) Arch of Pavenham, Bedford, a most extraordinary gentleman. Joseph Arch had seven children, three girls and four boys, John, Joseph, Edward and Thomas. Edward was my father and the only child to leave England, for which I don’t think he was ever forgiven. After Joseph visited Canada and the U.S., particularly New York City and Boston, where he was treated royally by union people, and related these experiences to a young boy, my father looked upon Canada and the U.S. as the land of milk and honey. Edward was a talker like his father and Joseph had plans for him going into Government service when he was older, so it was a terrible disappointment when my father emigrated to Canada and subsequently to Massachusetts. Coincidentally, like his father, Edward also had seven children, of whom I was the youngest. Between my brother and me we have three grandsons, but none of them are married, so unless something happens with them this line dies out with them. There are a number of Arches in Florida, but, according to Mary Arch Thompson of Grand Cayman, these are Cayman Island descendants of Heber James Arch, who was ship-wrecked off Cuba. Youngest son, Thomas’s wife, Elisabeth, died in childbirth, leaving a daughter, Daisy Isabella, who was eventually adopted by her Aunt Annie and her husband, Rev. Leuty. Daisy Isabella was her grandfather’s favorite and inherited the Cottage and its contents upon the death of Joseph’s second wife. The Leuty family settled in York and Daisy’s son, Bill Taylor, lives there now. Bill was the only descendant of Joseph’s that Harry ever could find in England. In the Mills family there has been discussion as to my grandmother’s first name, Mary Ann or Marian. Her given name was Mary Ann, but she preferred Marian. I know this because I have a sampler that she did when she was twelve years old and on this she embroidered her name as Marian Mills and not Mary Ann. In 1987, 1988 and 1993 we had the pleasure of visiting with Harry in Pavenham, visited Barford on all three occsions and in 1987 were invited by the then occupant of the Cottage to walk all through it. A very exciting trip with very pleasant remembrances. I found your site by accident, and hope maybe you can help. I have in my family William Samuel Gardiner married Lizzie Matilda Hall 20th Oct.1890. William was living at the time in Wasperton. William's Fathers name was Samuel. Was this family local or was William working in the area at the time? Would be glad of any help. to e-mail information to Elizabeth. I am researching my Harding family history. I know part of my family came from Atherstone. I would like to hear from anyone who has Mary Anne Harding, whose Mother is Leah Harding, as part of their family. Mary Anne's christening date was 30th August,1863, Barford, Warwickshire. to e-mail information to Yvonne. There are a lot of useful genealogy sites on the web, and the Barford Community website could soon be added to that list, if you provide us with the information! We have started a list of links below to some of the relevant sites we have found. If you know of any others, please let us know by to e-mail the details to us. If you need help tracing ancestors who may have lived in Barford, Sherbourne or Wasperton, then to e-mail, and we will post your request for information on this page.